"Quiet background, more details "
"Compact, very low weight, extreme small size "
MEC-50 and MEC-100 come as potted and tested modules. They are intended to either upgrade existing tube amplifiers, or build new. They are not suited as choke input filter nor as active anode load, as they do not store energy. Designers Menno Vanderveen and Guido Tent decided for these designs after the positive response of the E-choke, in 2009. 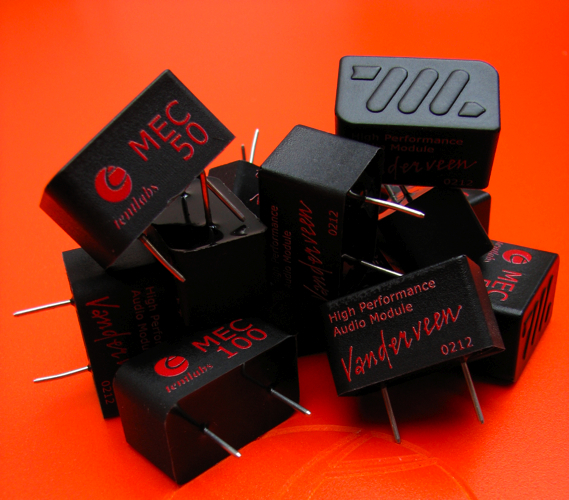 MECs typically fill the gap towards smaller power amplifiers (100mA) and preamplifiers (50mA) where the E-choke is too big. This module is warranted for 5 years, assumed all mounting instructions are followed. Shop for MEC-50 or MEC-100. OEM customers, please apply for more info.